Robert S. Weiner, a former White House spokesperson during the Bill Clinton administration and a top aide to the late Sen. Edward Kennedy and four senior Members of Congress, will be the keynote speaker at the 10am-12noon November 12 2011 National Forum on Obama and Christian Loyalty at Wayne State University Spencer M. Partrich Law School Auditorium in Detroit Michigan, 471 West Palmer Avenue, Detroit, MI 48202. The event which is free and open, a rare gathering of national and local faith and political leaders, marks the official launch of Michigan Chronicle newspaper Senior Editor Bankole Thompson's latest book on the intersection of faith, politics and governance titled "Obama and Christian Loyalty" published by Global Mark Makers (http://www.globalmarkmakers.com). Thompson has had a series of sit-down interviews with Obama. In his keynote, Weiner will ask how is it religious to oppose health care, jobs bills, housing aid for poor, Social Security for Seniors, or argue to "Let Detroit Go Bankrupt", when compassion is the basis of religion. The book's foreword was written by Bishop P.A Brooks, First Assistant Presiding Bishop of the Church of God in Christ Inc., and a guest chaplain of the 102nd Congress in Washington DC. The book, "Obama and Christian Loyalty", contends that a political leader who is of the Christian faith is tasked by the bible to fight for the poor, the weak, the voiceless and the oppressed, irrespective of their creed, race, political persuasion and location. It also contends that no one party or religious leader like Rev. Franklin Graham has exclusive ownership of God, and since Christianity is not like law, accounting or medicine that requires professional screening and board certification, no leader of the evangelical right is biblically justified to question President Obama's adherence to the Christian faith he professes. The book is part analysis and part interviews with Michigan-based Republican strategist Paul Welday, Texas-based Rogelio Orta of the Latino Christian Business Network, Los Angeles-based Hyepin Im of the Korean Churches for Community Development, North Carolina-based Christian author TN Williams, Abuja-based philanthropist and IT consultant Cordell Uzonwanne, Minnesota-based educator Dr. Brenda Lewis, California-based attorney and self-described "recovering Catholic" Kathleen Weidner, and Bishop Charles Ellis, Presiding Bishop of the Pentecostal Assemblies of the World (PAW). "The depth of Bankole's research, creativity and persistence in completing the work shows why this book is an important reference on the intersection of religion and politics and offers a profound perspective on a historic presidency. One does not need to be a lightning rod to be guided by religion. Newly released tapes by Jacqueline Kennedy Onassis reveal that President John Kennedy prayed every night," Weiner wrote in the book's epilogue. 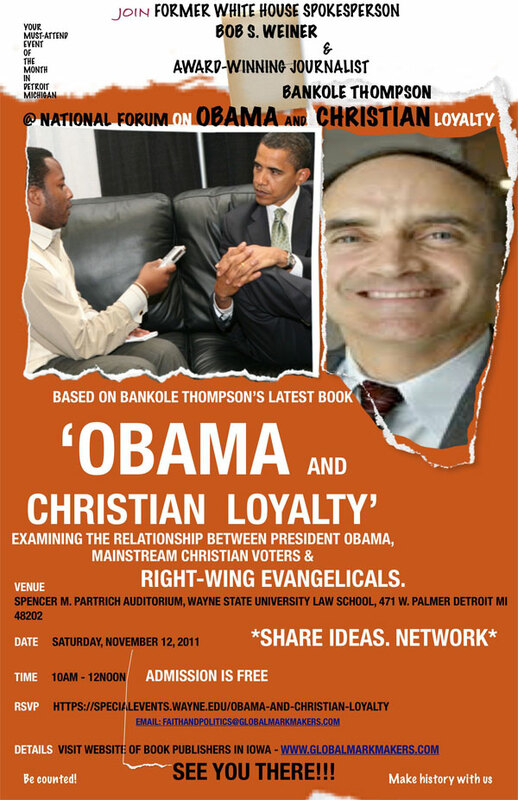 Thompson's "Obama and Christian Loyalty" is the second book in a six part series on the Obama presidency including his forthcoming books "Obama and Jewish Loyalty," and "Obama and Business Loyalty" set for release in 2012.